Alexey Navalny has been sentenced to 20 days of administrative arrest for organizing violent protests that caused damage to police property. One more civil sentence will result in the activist facing a criminal prosecution. The sentence was passed by the Simonovsky court on Monday evening. The judge pronounced Navalny guilty of organizing illegal protests that had led to damages of human health or property. The court said that the activist had played a key part in launching a protest rally on Tverskaya Street on September 9 – the latest nationwide single elections day. Russian law forbids any street events on such days, and police stopped the march before it started, but some of the protesters managed to cause damage to state property – scratching the paint on one of the police cars. The commencement date for the sentence was set back to when Navalny’s previous detention ended on Monday morning, when he was arrested almost immediately after finishing a 30-day civil sentence for repeated violations of laws concerning rallies. Navalny was in custody on September 9, but the court decided that the activist had organized protests from prison, by giving instructions to his allies and posting messages on his blog, as well as on Twitter and through videos on YouTube. During the court sitting, Navalny repeatedly appealed for the judge to be replaced, but these requests were denied. He also refused to testify in the case and pleaded not guilty, but this had no effect on the sentence. It is expected that Navalny’s defense will appeal the ruling. The activist also told the judge in court that he expected a criminal case to be initiated against him while he is serving the latest sentence. The claim was based on Russian laws providing that anyone who receives three administrative sentences of this type within a six-month period can face criminal charges if the alleged crimes involved damage to property or human health. 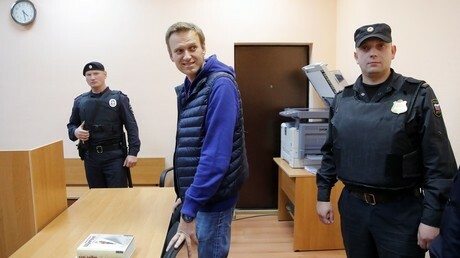 Navalny received civil sentences in mid-May and in late August this year, making the Monday sentence his third in just four months, and the new sentence did involve damage to property. The Criminal Code provides for punishment of up to five years in prison for repeated violation of the law on rallies. In February last year, the Russian Constitutional Court confirmed that repeated violations of street-protest rules can carry criminal responsibility, but warned against a formal approach to cases. It emphasized that the existence of several court verdicts ordering civil punishment for the same defendant should be the main criteria for applying the rule. They also noted that the prosecution must prove the suspects’ criminal intention in every civil case.